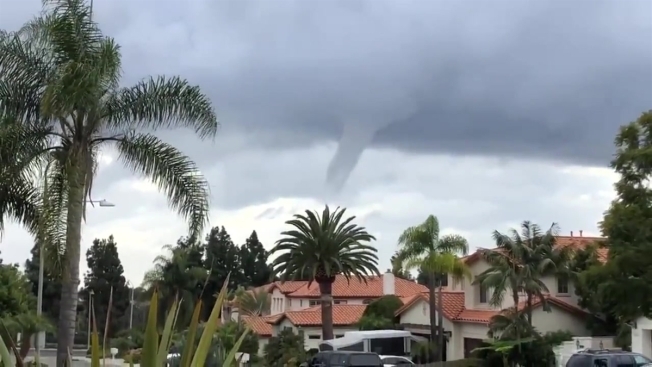 A funnel cloud developed over the Encinitas-Carlsbad area Monday afternoon as a result of a heavy rain cloud that moved into the area, according to the National Weather Service. The funnel cloud appeared to a continuation of a weak waterspout that was spotted over in Carlsbad and dissipated as the rain cloud moved further inland, according to the NWS. The funnel cloud was first reported around 2:20 p.m. and lasted about 15 minutes, NWS meteorologist Bruno Rodriguez said. Funnel clouds are a common occurrence, happening a few times a year in San Diego, typical over coastal area, he said. In order for a funnel cloud to be considered a tornado, it needs to touch the ground and this one did not. The funnel cloud caused some excitement over social media as people share photos and videos of the funnel online. NBC 7’s viewer Sydney Hastings sent in this video of the funnel in Carlsbad. If you have an interesting video or photo to share, be sure to send them to isee@nbc7sandiego.com.